Courtesy Albion firefighter Phil Jacob was honored for his 50 years of service by Gov. Eric Holcomb at the Statehouse last week. Gov. 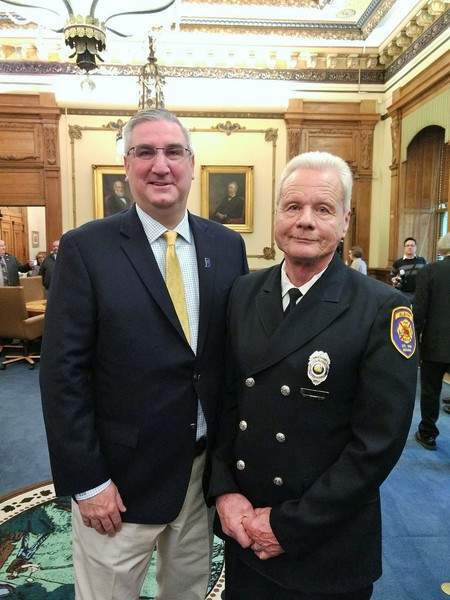 Eric Holcomb recognized longtime firefighters at a recent State Capitol event, including 50-year volunteer Phil Jacob of Albion. Jacob joined the Albion Fire Department in 1968, a time when the firefighters were alerted to calls by party-line-type telephone calls, and their newest truck was a 1965 Chevy/American LaFrance pumper, a news release said. Over the years, he served many positions with the department, including captain and assistant chief. He was chairman of the department's 125th Anniversary Committee. Jacob's lasting legacy, the news release said, will be his work as Albion's fire prevention officer, a position he has held for more than half the time he has been with the department. Jacob is a familiar sight in Albion schools spreading the message of fire prevention. In the late 1990s, he spearheaded a campaign to purchase a mobile learning center, which is available for fire prevention activities. It is estimated he has talked to more than 15,000 students and adults, taking the message of saving lives through education to various schools and organizations. As a result, he was Albion's Citizen of the Year in 1998 and won Parkview Hospital's Good Samaritan Award in 2000. Jacob's father was also a fire chief, and his three sons are members of the department. Sen. Dennis Kruse, R-Auburn, was recently named as one of the recipients of the 2018 Central States Simon Award. The award is given to an individual from outside the language teaching profession who has demonstrated leadership in the promotion of language exemplifying Sen. Paul Simon's dedication to and enthusiasm for the areas of language and international studies. Kruse was recognized for his continuous efforts to introduce legislation that strives to better education for Hoosier students. The award will be presented March 9 in Milwaukee at the annual Central States Conference Awards Ceremony. Who won Tuesday's debate by candidates for the Republican nomination for a U.S. Senate seat from Indiana? All three of them, apparently. “Mike Braun Dominates First Debate,” the campaign said in a statement, using all caps, about the Jasper businessman. But the campaign for U.S. Rep. Todd Rokita said Rokita “dominated” the debate in downtown Indianapolis, which was organized by the conservative Americans for Prosperity-Indiana. The winner of the May 8 Republican primary election will face Democratic Sen. Joe Donnelly in the general election. The Republican candidates are scheduled to debate again April 23 in Fort Wayne at the Allen County Republican Party's Lincoln Day Dinner. U.S. Rep. Jim Banks has been named a finalist for a 2018 Democracy Award, given by the nonpartisan Congressional Management Foundation. The awards recognize nonlegislative achievements and performance by congressional offices. Other award categories are innovation, workplace environment, and transparency and accountability. In all, 20 senators and representatives – 10 Democrats and 10 Republicans – were nominated. The foundation said a Democrat and a Republican will be selected as winners in each category. The judges will primarily be former members of Congress and former congressional staff members. The Indiana Republican State Central Committee has elected Anne Hathaway of Indianapolis as a member of the Republican National Committee. Hathaway, a former chief of staff for the RNC, replaces Marsha Coats as Indiana's national GOP committeewoman. Coats, the wife of Dan Coats, the national intelligence director and a former U.S. senator, resigned from her position in September. State GOP spokesman Pete Seat said Hathaway was the only person nominated and was elected by acclamation. Her term runs through the 2020 Republican National Convention. Hathaway is president and chief executive officer of public relations firm Hathaway Strategies, executive director of the Richard G. Lugar Excellence in Public Service Series and executive director of the Indiana Medical Device Manufacturing Council. She is the 7th Congressional District Republican chairwoman and was scheduling director and public liaison for then-Vice President Dan Quayle.